Payments via mobile have come a long way since Apple made a significant push into space by introducing Apple Pay. Android Pay was introduced by Google last year and Samsung has joined the movement by introducing its own mobile system which is called Samsung Pay (the app used to access the service is called Samsung Pay App). Here is what you need to know about Samsung Pay below. What is Samsung Pay for? Samsung Pay is not just for basic transactions at the store or pharmacy. Samsung is bringing up a pay-it-forward program for its users that refer the services to friends and family. Samsung also keeps adding new forms of payment continuously which include everything from gift cards and online payment and removing cash from ATMs. Some of these features are not available in all countries, though. Here, customers that make use of the payment service instead of other platforms like Android Pay are offered rewards by Samsung using the High Five Referral Rewards program. For every time a user refers someone who makes their first qualifying purchase, the user earns $5 in Samsung Rewards which is deposited automatically in the Samsung Pay app, which is the same way reward cards are added. This is only applicable to 30 people referred by the user. This means the user would be able to make a maximum amount of $150 and would be able to utilise! the money at any merchant store where Visa debit cards and Samsung Pay is accepted. Membership and loyalty card accounts could be added to Samsung Pay as of the middle of May 2016. A card can be added easily by scanning the bar code located on the card or entering the account number manually. In South Korea, the service could be used at specific ATMs to withdraw cash. Only Samsung users who run accounts in Woori Bank, Industrial Bank of Korea, NH Nonghyup Bank and Shinhan Bank can utilise this service as stated by the Korea IT Times. It was stated by the co-general manager for Samsung Pay that updates would be made to the mobile payment service so it can be used to carry out payments in the U.S in 2016. In an announcement made by Samsung, it was stated that there was gift card support for Samsung Pay from 50 retailers which include Nike, Domino’s among others. The app has a gift card store that provides users with the capacity to purchase gift cards from merchants for themselves or it can be given as a gift for family and friends straight from the app. The Samsung Pay app would not be uploaded for download via the Samsung store or the Google Play Store but can be installed by using the system update and updating the system software. This would install the Samsung Pay App on the user’s phone with ease. The update is 660.90MB in size. 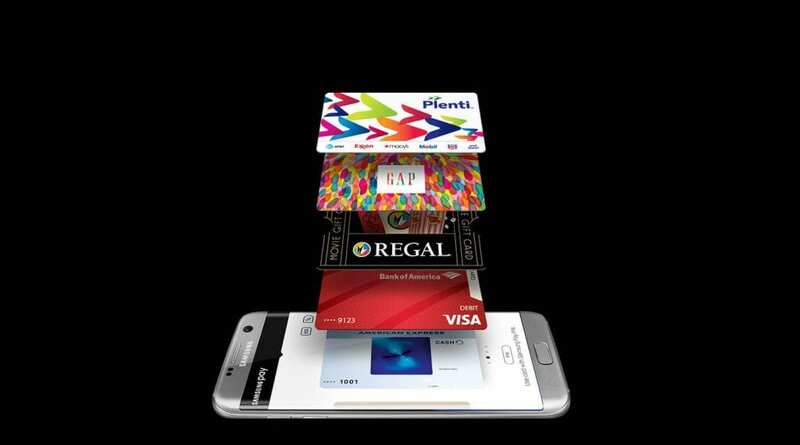 On the Samsung devices which would be released later in future, Samsung Pay would be installed automatically. All the user has to do is to touch apps from the Home screen, then select Samsung Pay. Next, the user presses the INSTALL to download the needed file, then selects INSTALL again to start the installation. Merchant Credit Cards: AutoZone, Bose, Boston Interiors, Exxon, John Eagle Toyota, Just Brakes, Meineke, Midas, Mobil, NAPA, Pearl Vision, Pep Boys, Plano Cycling & Fitness, Sleepy’s, Sunglass Hut, & VCA Animal Hospitals. I believe by now you know everything there is to know about the Samsung Pay App, its uses, features, applications, requirements and how to earn rewards with it. If you have any questions regarding the Samsung Pay App, use the comment section below or shoot us a mail using the contact page.